Junior quarterback Malik Zaire will enter a high-pressure situation Saturday when he begins his first season as Notre Dame’s starting quarterback, but head coach Brian Kelly doesn’t want Zaire believing he has to put the whole team on his back. Just like many of the 80,000-plus fans crammed into Notre Dame Stadium on Saturday, Kelly said his gaze will be focused on his new quarterback. “Eyes are still going to be centered on the quarterback play,” he said. “As much as we’d like to say Malik’s a veteran, he’s still not. He played really in one game for us last year, and he didn’t play the whole game. 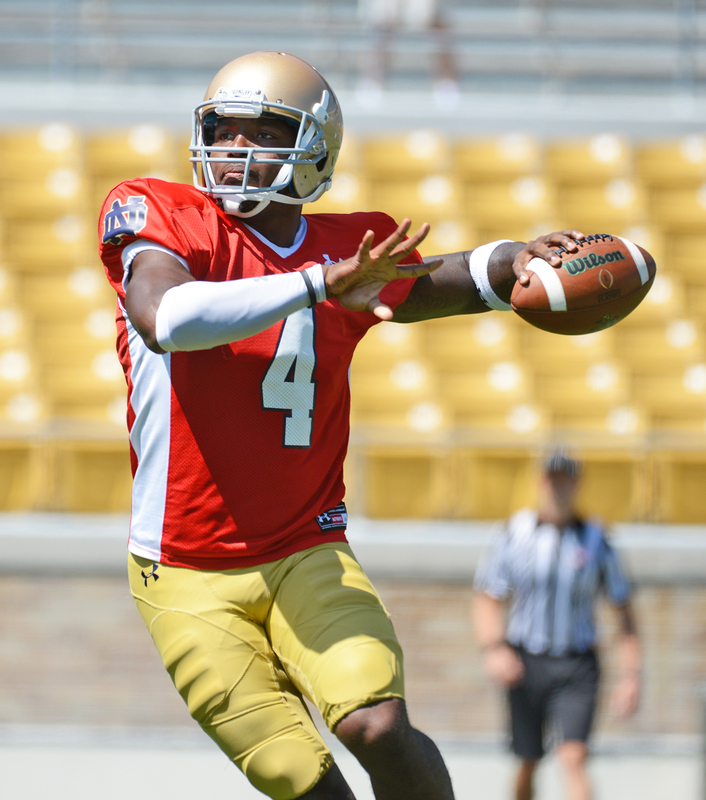 Junior quarterback Malik Zaire tries to find an open receiver during a practice on Aug. 21 at Notre Dame Stadium. Of the 33 true freshmen listed on the Irish roster, five will have the chance to see playing time against Texas on special teams, Kelly said: receivers Equanimeous St. Brown and C.J. Sanders, running back Josh Adams, cornerback Nick Coleman and kicker Justin Yoon. Two of them are slated to start for Notre Dame, Sanders as punt returner and Yoon at kicker. Two other freshmen are also listed as second-stringers on the team’s depth chart: Jerry Tillery on the defensive line behind sophomore Daniel Cage, and Alizé Jones at tight end alongside three other players. Kelly said Tuesday both of them should play this weekend. Freshman cornerback Shaun Crawford underwent surgery Thursday for a torn ACL suffered Aug. 19 in practice. Crawford drew praise from his coaches and teammates during the preseason and was making a push for immediate playing time before the injury. Kelly said there were no other injuries to report before Saturday’s matchup. He added senior running back C.J. Prosise, who was sidelined earlier in the preseason for a hip flexor injury, is fully recovered. “He’s had two solid weeks of practice to get where we need him to be, so we have no concerns or issues with his health,” Kelly said. Senior cornerback KeiVarae Russell takes a break during a practice Aug. 21 at LaBar Practice Field. 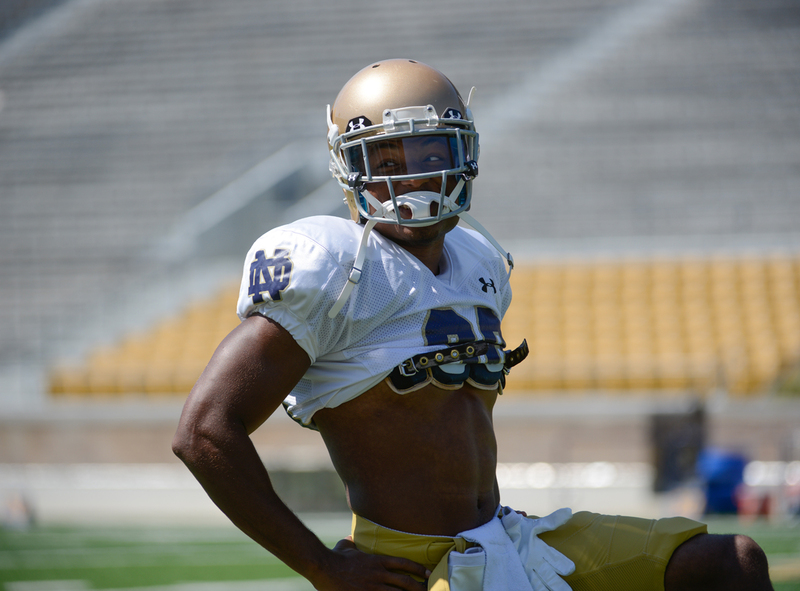 Russell will make his first appearance for the Irish in over a year against Texas on Saturday. Two cogs of Notre Dame’s defense will hit the field against the Longhorns after long absences from competition: senior cornerback KeiVarae Russell and graduate student linebacker Jarrett Grace. While Kelly said he always believed KeiVarae would inevitably lace up again for either the Irish or another team, he was less optimistic with Grace. However, the head coach said Grace will lineup with the kickoff team Saturday.